Diana Dyer, MS, RD: At the Farmers' Market - At Last! 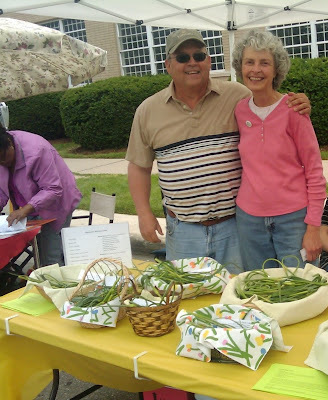 My husband and I grinning like little kids on Christmas morning on our debut day as vendors at the Ypsilanti Downtown Farmers' Market June 8, 2010 - photo taken by Cara Rosaen, Marketing Director for the brand new website RealTimeFarms.com. Please check out this website - it is designed to connect people to fresh, local sources of food by providing "real time" information (including beautiful photographs) about the location of farmers' markets around the country along with what is available to purchase today, right now, , i.e. "real time". It is an interactive site that you (yes, you!) can also use to load up information about what you see available at farmers' markets where you live. Help promote locally grown food by your local farmers! Your local farmers (like us!) thank you from the bottom of their hearts. :-) Unlike grinning kids who have the pleasure of having gifts just appear on Christmas morning, my husband and I fully appreciate every aspect of both the years of hard work leading up to this moment and our extreme good fortune to have arrived at this moment. I just turned down a cancer survivorship speaking invitation because I am too busy farming, but that does not mean I have forgotten "where I have come from" to get here. I am a very grateful cancer survivor every single day, hoping that I can still help others plant and cultivate their own seeds leading to a successful survivorship journey, too. Labels: Cancer survivorship, What's New? Hello Diana. Lovely photo. I'm so glad you shared it. From your recent blog posts I know you've been working hard but it doesn't show in your faces or posture. You, your husband and yes, even your scapes are glowing.